It’s summer time in Ireland, the children are off school, the Galway Races are fast approaching and the summer holiday you’ve been waiting for all year is finally here! 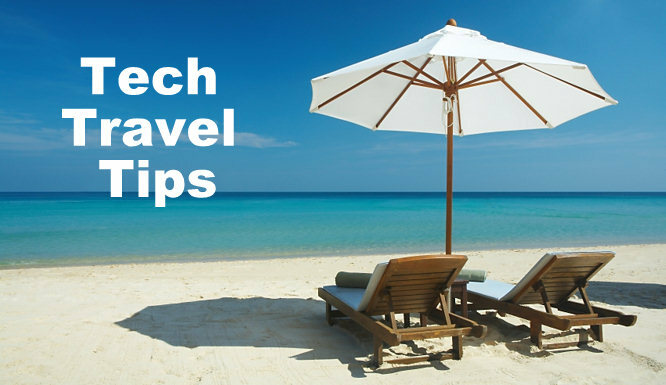 It’s time to relax, so read on for our tech travel tips to avoid tech stresses whilst abroad. Your phone’s battery is going to die a lot quicker on holidays because of all the extra snaps you’ll be taking, carry around a spare power bank to recharge on the go. Why not try a solar charger? Bring a 2nd power bank that also doubles up as a storage device so you can back up all your precious photos and videos each evening. Cloud apps like One Drive or Google Photos are great for this too, but then you’re reliant on a strong internet connection. Tech up your suitcase with a smart Bluetooth padlock like a Noke, that lets you unlock your case using an app on your phone. Family trip? Try charging 4 phones, a tablet, a laptop at night and then fight over adaptors for hairdryers, hair straighteners…etc in the morning! Bring a Belkin portable power strip and thank us when you get home. A good pair of noise-cancelling headphones can help you escape a noisy passenger in the aisle across from you or make a noisy downtown hotel room bearable. Look for ones with active noise cancelling – these usually have a switch to activate and do the best job of filtering outside noise. Bluetooth speakers are great to share your music whilst chilling on the beach or getting ready to go out. Selfies on the beach? Sand and water don’t mix well with smart phones. Get a good phone cover, buy insurance and make sure you’ve backed up your phone either to your storage device or to the cloud.